With AirDuplex™ technology, MIMOtech's Janus product achieves up to 1.5 Gigabit per second* throughput in a single 56 MHz channel (go + return) with a single radio unit (or up to 750 Mbit per second in a single 28 MHz channel). Why go up to millimeterwave frequencies for your backhaul when you have spectrum below 42 GHz that could be used to achieve throughputs in excess of 1 Gigabit per second? Air-Division duplexing is a patented duplexing method that makes use of MIMO and spatial multiplexing techniques to achieve simultaneous transmission and reception of data on each carrier frequency. Air Division Duplexing doubles the throughput capacity of the MIMOtech Janus AirDuplex™ compared to traditional microwave links making it possible to achieve a full duplex throughput of 750 Mbps in a 28 MHz channel allocation** or up to 1.5 Gbps throughput in a 56 MHz channel allocation. **Note the 28 MHz Channel Plan = Go + Return frequencies for normal FDD spectrum allocation or 28 MHz + 28 MHz in a TDD spectrum allocation. In both cases, Co-Channel Dual Polarization (CCDP) is enabled. The latest edition to the StarBurst family is the Janus Microwave AirDuplex™ which makes use of Air Division Duplexing, a patented spatial multiplexing technique that doubles throughput capacity when compared to traditional microwave products. This new approach makes full use of the allocated frequency spectrum by achieving simultaneous both-way transmission on the same channel frequencies. Patented Air-Duplex™ technology gives superior throughput performance with Air -Division Duplexing (ADD). High Spectral Efficiency up to 27 bps per Hz achieved with spatial techniques and modulation up to 512QAM. Software Definable Radio implementation provides flexibility and cognitive ability. 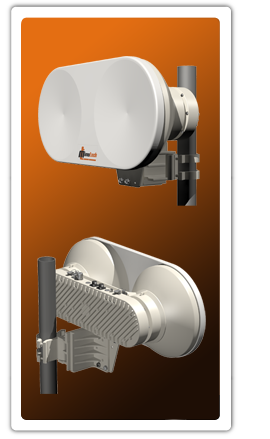 Available in selected frequency bands including 15, 18, 23, 38 and 40/42 GHz. *Layer 2 Throughput with No Header or Data Compression.